Join us as we head to Germany to discover a charming villa located right on the river Rhine (yes, that famous river that starts in the Swiss Alps and opens into the North Sea at the Netherlands). German architect Martin Lehnen takes the credit for today’s architectural highlight on homify 360°, which has seen two distinct renovations (Lehnen being responsible for the most recent one). 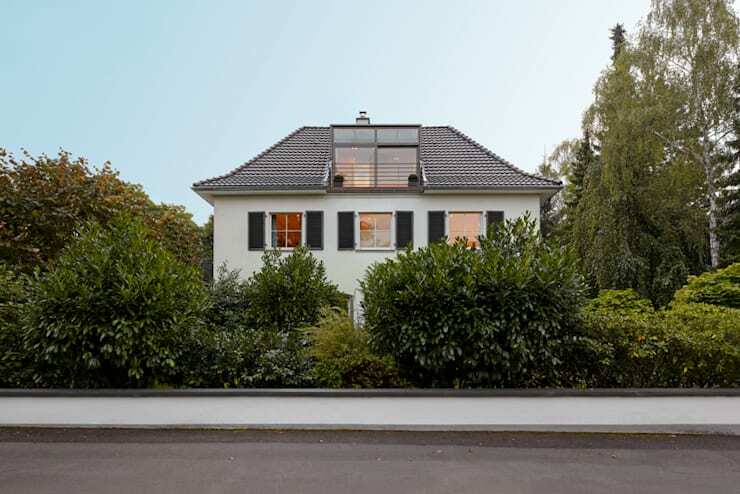 The original villa dates back to the 1930s, where it enjoyed a direct view of the Rhine. 71 years later, the first renovation commenced and focused on the ground- and first floors. 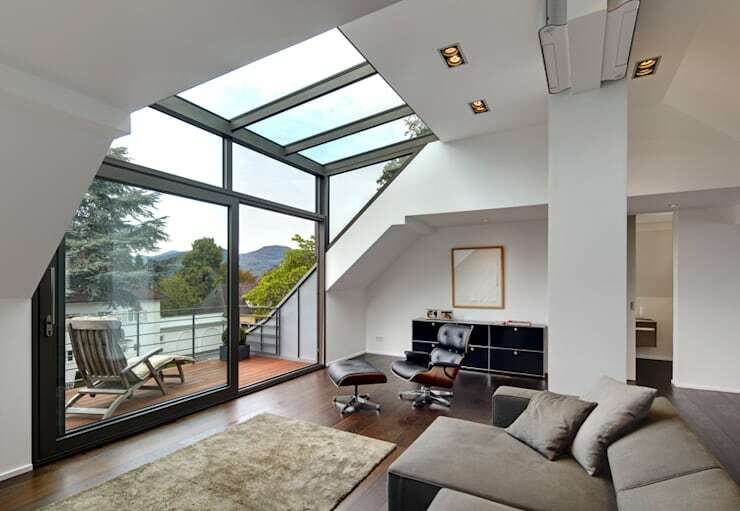 In 2011, the loft- and entrance areas underwent a modern transformation as well, securing this villa’s spot in the modern section of the architectural realm. This dwelling boasts a stylish finishing, with a chic back facade that makes the front side look like an entirely different house. This is the view of the front façade, seen from the street. More classic and elegant than what is usually expected from the modern style, this traditional front side echoes the original structure from the golden 1930s. The results of the renovations are more explicit at the back of the house, as we’ll soon discover. The second restructuring phase resulted in the glass dormer clearly seen at the top of the villa – a unique modern touch that tells us that the only thing that can be expected here is the unexpected. Trust us, this is the same house! From a closed and discreet front entrance that allows for peace and privacy, to a more open and transparent back view. What a magnificent altering! The reason for the drastic modification is because the homeowner sought a modern extension of the villa, and a welcome opening onto the lush garden at the back. Now forming a strong link with the garden, the rear side of the villa is a completely new character, yet still as charming and welcoming as its front counterpart. The dining area, revelling in the natural light streaming through the double-storey windows. Here is where the term ‘spaciousness’ earns its true meaning, thanks to the elevated height of the two-floor ceiling. Breaking away from the concrete and metal, the dining table and chairs demand our attention with their tanned wood finishing. One can almost hear the laughter of jolly guests that is certainly experienced at this table, floating up to the second floor. Another addition that was implemented during the second renovation phase was the grinding of the granite flooring – just see that delicious contrast between the warm wood and cool grey flooring. On to the living room for a warm and cosy atmosphere, and it’s not just because of the inviting fireplace. The colour palette embraces its neutral tones to the fullest, and one cannot help but relax upon entering this serene space. The living room is the only room which has remained largely unchanged through the renovation processes. The original oak parquet floor (in that stunning herringbone pattern) has been carefully protected after all these years, and still provides a wistful, welcoming ambience that is so unique with wooden floors. Well, we have found the ideal leisure spot, now what to do here? Grab a book and lose ourselves on that fantastic sofa? How about setting the mood with a melody on that gorgeous piano? From a chromium grey ground floor to a warm wooden platform for the second storey. Connected by an urban-style staircase, the corridor of the second floor has been kept largely clean and open, adding to the flowing spaciousness of the villa. Standing on the second floor provides not just a grandiose view of the dining and socialising areas below, but, thanks to the enormous glass glazing, also of that lush lawn waiting outside. Can’t decide between urban, classic, or rustic for your staircase? 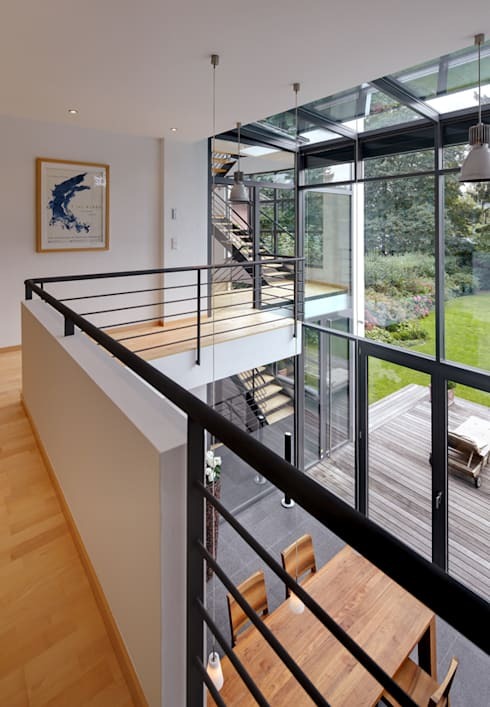 Get some inspiration from: Which Staircase Fits The Best To My Home? So this is what the loft looks like today—remember the glass dormer on the roof from the street view outside? After an impressive reformation, the loft went from a mere 3rd floor to a fashionable relaxation zone. More glass for natural light (and views). A plush sofa for relaxing, as well as a neutral colour scheme to enhance the modern and sleek space to its fullest. The loft received a new floor covering during the first reconstruction phase, and a guest bathroom was also added. When the time came for the second renovation, the idea was to echo the lower floors in terms of style, colour and ambience. Fast-forward to today, and we have a tranquil lounge area fully utilising the volume of the roof and loft, perfect for enjoying morning coffee while watching the rising sun (or a sundowner on the terrace outside). One good view deserves another, which is why we end our inspection of this villa with that fabulous backyard terrace. It should come as no surprise that the garden also underwent some major transformations (during the second renovation phase), and is now a striking, open area perfect for the modern structure with which it shares its space. Exterior dining, sunbathing, reading area… the possibilities are endless with a balcony, porch and terrace. Take a look for some visual stimulation. Like looking at two different houses – one classic, one ultra modern. Which style do you prefer?